were touring the United States on motorcycles when they suffered an unfortunate crash and ended up in a local hospital. Said Amanda: "We met what I would like to believe were real Americans right from the beginning, some of the finest people we have ever met. To the strangers that helped us on the road, thank you for taking time out of your day to help me as I lay on the highway. To the Highway Patrol who took control and managed the situation with compassion and efficiency. To the fire rescue, you offered so much comfort with your experience. To the sweet EMS staff that calmed me by telling me the damage to my bike was cosmetic. But most off all to the hospital staff. We were nervous about the U.S. medical system but that was soon dismissed as we got such wonderful care from the time we went through the doors. There are so many others that made a positive impression, the hotel staff where my husband stayed waiting for my discharge, the clerk at Rite Aid, the medical transport to LAX. The bottom line is that Bakersfield showed us just how wonderful a country the USA is. Here is a big thank you to one and all." * … SPOTTED: A woman in an old green van casually tosses her fast food wrappers and soda cup out the driver's side window while driving down Mount Vernon. When she stops at a light, she empties her ashtray. * … OVERHEARD: In the Vons at The Marketplace a woman is telling a friend about her children going back to school. "God knows I love them but I can't wait to get them out of the house." * … FOODIE BEST BET: Cafe Med has brought back its half off appetizers during happy hour, as well as $3 beer, $4 wine and $5 martinis. Always a best bet for quality food and drink. * … DATE NIGHT: Looking for something fun to do this Saturday? Then you might consider Date Night at the Fox Theater which will be showing the 1980 film Somewhere in Time starring Christopher Reeves and Jane Seymour. Admission, hot dogs and drinks are just $1 each. Doors open at 6 p.m. and the show starts at 7 p.m. It's a chance to see all the work the Fox Theater Foundation has done on bringing the old girl back to glory. * … VILLAGEFEST: Get ready for another VillageFest, the always popular event that is expected to raise $160,000 for charity. The event, featuring craft beer, music and food, is set for Saturday, Sept. 6, at the Kern County Museum from 6 p.m. to 10 p.m. There will be beer from more than 60 breweries, wine and plenty of food, not to mention 15 local brands. The attendance is expected to exceed 5,000. The event has always been a fundraiser for C.A.R.E. (Children’s Advocates Resource Endowment), a non-profit organization serving the needs of Kern County’s children since 1999. Tickets are $70 and may be purchased at Vallitix, Lengthwise and Frugatti's Italian Restaurant. weekly, hour-long yoga sessions and the other that continued with their normal activities. The result? "Yoga appears top be too gentle physically to be anyone's lone exercise. "Yoga will certainly strengthen your legs but you need to include other forms of exercise in your weekly routine to obtain more complete fitness. 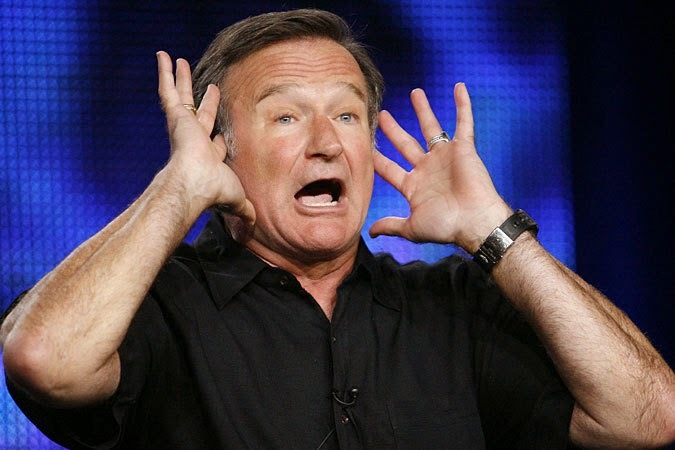 * … WILLIAMS: Let's hope the death of comic genius Robin Williams focuses more attention on depression and related illnesses that are near epidemic in our society. I know of very few people who have not dealt with severe depression in their own families, and it is long past time for an honest conversation about this national malady. * … PANHANDLERS: More feedback on the panhandlers across our community. This note from reader Terry Meier: "I understand there are needy people in our community, but being confronted by them at every turn is aggravating. I was even pinned down by one in the drive-through line at Starbucks! My husband and I give generously to charities every year, so I have no guilt in turning them down. Furthermore, I’ve seen some of them work the same area telling the same story over and over.… I’ve joked with my friends that I’m going to make a large sign and stand on a corner or median and beg for money to buy an iPad. Hey, I’m a part-time professor so I need the money!" * … RADIO WARS: The local radio group American General Media has acquired another FM signal in its battle to attract more listeners throughout the day. The new FM signal will simulcast the First Look with Scott Cox morning show that originates in the newsroom of The Californian and is video streamed live on Bakersfield.com. The show will be simulcast at 96.1 FM. The sale is subject to approval by the Federal Communications Commission and should be completed by Thanksgiving. * … BACKPACK: Kudos to the North Bakersfield Rotary Club whose members stuffed 675 backpacks for students of the Standard and Beardsley school districts. Chevron chipped in to help fund the program, called Kindergarten Roundup, and club President Sheri Horn Bunk tells me they will be distributed as soon as school starts. * … BAD FORM: Barbara Waggoner was at the Ramco gas station downtown recently when, to her surprise, a red haired woman walked to her car, started it up and began pumping gas while the car was idling. "Surprised that someone would do such a stupid thing, I asked if she realized she could start a fire. She gave me a 'really?' look. I told her a friend of mine had seen it happen. After I got the same look from her again, the back window rolled down and out popped a small child. I was thinking now not only does she want to take the chance of blowing all of us up but wants to blow up what I assume to be her grandchild." * … GOOD FORM: And then there was Dr. Randal Beeman who crashed on his bicycle at 18th and Chester the other day. No fewer than three different people stopped to help him. "When I go to other places and hear the standard blather about Bakersfield I remind myself that even though we live in one of the largest cities in California we still exhibit the small town values of cooperation and kindness towards others." * … OUTLETS: I stopped by the Outlets of Tejon the other day and left impressed with the design, location, convenience and of course the retailers. These are outlet stores after all, but the Tejon Ranch Company did a remarkable job with the layout, seating and water features. If you haven't been, check it out. * … SCAM: Yet another scam alert, this one from reader Buddy Maltone. "I received a letter along with a check for $1,850 stating I was the winner of the USA/EU Departmental Sweepstakes Lottery held on Jan. 1, 2014. The letter and check were from Western States Mechanical from Springville, UT. The letter states I will receive the balance of the $50,000 owed to me after I contact the claims agent Peter Jones. The check was from a Wells Fargo account of which Wells Fargo has my banking relationship, so I contacted them. Not to my surprise, I was told the address on the check was an ATM location for Wells in UT. I then contacted the claims agent, Peter Jones, and he congratulated me on my 'winnings.' When I questioned the ATM location check he hung up on me. I fully recognized this as some type of scam and should have waited to expose this to the claims agent and see how much $$ they wanted me to send ,but I could not have waited to screw with them. I also contacted Western Mechanical to let them know what was going on because after research, they were a legit company and were aware of this scam." * … BAD FORM: Linda Boyance was at the Kern County Animal Shelter on Fruitvale recently when she witnessed what can only be described as a bit of bad form. With her was a man holding a very skinny Shiatsu which he had found in the street on a hot day. It was Wednesday and the shelter does not open until 2 p.m. "He went to a side door and found a lady behind a desk. The door was locked. Through the locked door he explained his concern for the dog. He said the lady pointed at her watch, told him they didn't open till 2, and to come back. He had told her he would have to release the dog back to the street. Another lady went to the same door and asked the lady if she realized the man was going to let the dog go? … What part of rescue did she not understand? The three of us were beside ourselves. A man in cut off jeans and no shirt came by and took the dog with him...I say shame on the part of that employee." * … FOODIE: My restaurant menu recommendation of the week: the seared scallops over risotto at the Wall Street Cafe on L Street downtown is excellent. * … FREE LIBRARIES: Austin Albert is at it again. 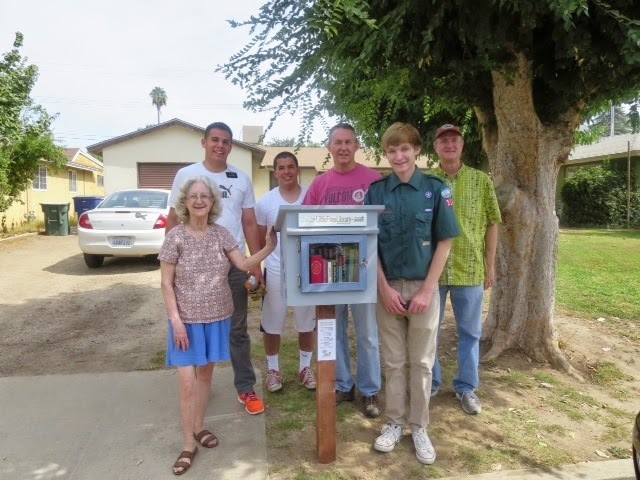 The 17-year-old Eagle Scout, who is headed to BYU-Idaho in the fall, wrote me that he had just installed four Little Free Libraries in the South High School District area for the community to enjoy. Said Austin: "The libraries are all stocked with an assortment of books and open for all to enjoy. They are located at: 1516 Belle Terrace; 912 Meredith Street; 900 San Vicente Drive and 5301 Lime Street. Just want to thank you and all the residents supporting literacy in the community who supported this project. 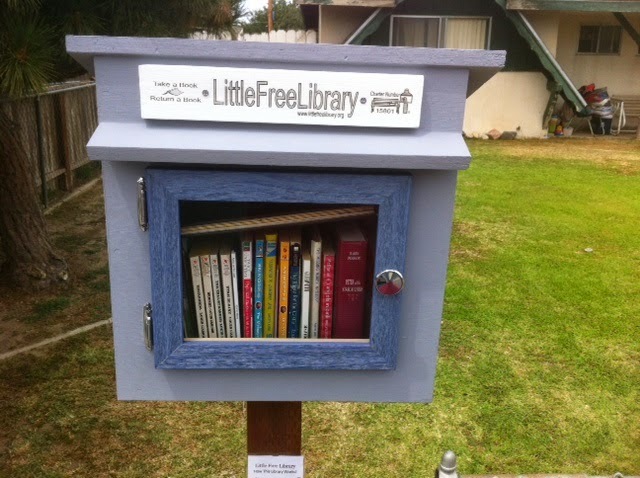 Locations for Little Free Libraries can be found anywhere in the world by visiting littlefreelibrary.org. * … GOOD FORM: Terry Meier wrote to thank the stranger who left a note on her car warning her that her car's towing wires were dragging on the ground. "It made my day!" she said. "If I hadn't been warned or noticed it myself, at best I would have had to replace the connector, and at worst, it could have sparked a fire. There truly are Good Samaritans in good ol’ Bako. "